Do you have Authority status as an author, expert, business owner, or thought leader? Are you looking to get more authority? Did you know authority can be manufactured if you know the secrets? 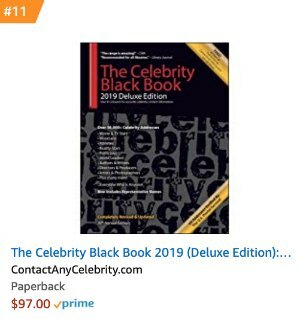 (Adam’s sister company, Advantage Media Group, published my book on celebrity marketing and publicity, ‘Celebrity Leverage: Insider Secrets to Getting Celebrity Endorsements, Instant Credibility and Star-Powered Publicity‘). Of course, one way to get more authority is to attach your book, business, product or cause to a celebrity. That’s where we come in! Another way is to get yourself or your business on TV and in magazines, newspapers, and websites. You’ll learn how to get on TV, use media logos for your site, and more. The truth is, business leaders have been using these tactics for decades. 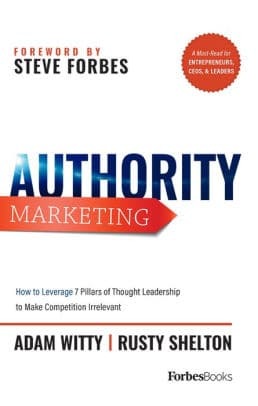 Now you can, too when you read ‘Authority Marketing’! ‘For most experts, PR and media is the crown jewel of the ‘earned-media’ category, and for good reason: few things outside of publishing a book do more for your Authority than media coverage. Almost irrationally, we assign buckets of Authority to someone who has been featured in Forbes or interviewed on FOX News, which is why PR and media is such an important part of your Authority blueprint. [Full disclosure: Contact Any Celebrity has been featured in Forbes]. The magic of such appearances isn’t the huge audience you reach — although that’s nice, assuming the interview goes well. Rather, it’s the ability to re-market that interview and the associated media logo from that point forward to build your Authority. Being interviewed and featured in the new — radio, television, print, and online — is one of the fastest ways to build credibility and expertise. Being interviewed regularly creates a sense of ‘omnipresence’ while positively building your brand. Additionally, when consumers see ‘As Seen On/In’ with numerous logos from prestigious media outlets, it immediately builds confidence and trust in the mind of the prospect. As mentioned in the branding section of this book, if you aren’t yet the authority, the quickest way to build Authority is by association — and few brands are more well-known to your audience than media brands. In a similar way to what we explored with content marketing, the best approach to get PR today is to have a push/pull approach, where you pitch ideas directly to the media. You pitch an article idea on a certain topic, or you pitch yourself as a guest to opine on specific topics. [Note: For opportunities to pitch yourself one-on-one to the media, check out the National Publicity Summit). This approach still works, particularly if you’re working with a good publicist who has fostered good media relationships. However, the journalism industry is shifting, and that new landscape is affecting how publicists and marketers approach media. In today’s media landscape there are fewer and fewer journalists at traditional media outlets, and those who remain are now tasked with more work than ever. They must fill up the newspaper, the website, and social media channels with good content. As such, you have more and more marketers pitching fewer and fewer journalists. We talk with media members who get upwards of 1,000 pitches a day! That means your pitch is a drop in the bucket. To be frank, unless you have an established brand or existing relationship, it is going to be very hard for you to stand out. This is another reason why news-driven content is such a vital tool. It allows you to widen your net around certain topics, as statistics show that journalists are increasingly turning to Google, Twitter, Help-A-Reporter, News & Experts, and other online resources when they need an expert to speak on a breaking news topic. When you have created a ‘newsjacking’ post, you widen your net to attract media to you rather than trying to stand out among a thousand daily pitches. [Note: For more on ‘newsjacking’ check out ‘Newsjacking: How to Inject Your Ideas Into a Breaking News Story and Generate Tons of Media Coverage‘ by David Meerman Scott. This also facilitates relationship-building with media personalities. Media members are more frequently looking to build these kinds of relationships with authorities, and if you are doing the same– a la Carol Sanford and her Twitter connection with influencer Sam Ford, you give yourself a much better chance to build these kinds of connections. Another thing we want to consider when it comes to PR and media is the value of publicity. 1. The first level is the audience you reach. If you’re doing a live TV or radio interview, or you’ve got an article published, the most obvious and direct piece of value is the audience that will see, listen to, or read the piece of publicity. They hear you speak or read your article and decide to hire you for a speech or buy a book from you. That’s what most people are concerned with when it comes to PR and media; they want to sell something or promote their services or products to that audience. 2. The second level of value, which is actually much more important in terms of building lasting Authority, is the ability to remarket that media coverage. When you have an article in Forbes, for example, that Forbes logo can go on your website and in your marketing materials for the rest of your career. That mention of Forbes becomes part of the way you’re introduced on TV or at speaking engagements. The remarketing of media coverage and the Authority by association that comes with being featured on major media outlets is one of the most important pieces of value that comes from publicity. If you’re reading this and you have not done media, then you don’t have media brand logos to showcase, and you should know that is one of the most important levers you can pull to quickly ramp up your Authority. The third level of value in publicity is also very important. It goes back to an idea we have talked about a few times in this book: the idea of not just entertaining and engaging audiences, but actually siphoning off that audience by giving people a reason to head to your stadium via the lead magnet you offer. In other words, you’re using that interview or article to drive people back to your owned media and grow your email list. T hat’s why it is so important to have the right lead magnet in place, so you really maximize your value from any publicity. Without that, you will only be benefitting from a fraction of the value you could be getting from publicity opportunities. A final point on PR and media is that in today’s world it has become easy to track your audience. That’s always been a tough question for PR firms to handle. But now, thanks to data-mining and analytics, we have the ability to track which people are interacting with which content online. Who actually likes your article? Who shared it? Who’s tweeting about it? How many people came to your website from the article? When it comes to PR and media, it’s important to have a strategy in place to maximize the value that any publicity may bring. It’s also imperative to track that internet activity to understand where that value is coming from. This is yet another way in which the new media landscape is creating opportunities for anyone interested in marketing his or her Authority. – Test your Authority status! Are you a New Media Novice, an Innovative Influencer, or a Stand-Out Authority? Most industries have numerous experts, but very few rise to authority status. Are you one of them? Take the Authority Assessment to find out!